The set design features a playground to show that adult problems are similar to children's problems. Members of the FMU Theatre Program performed the play “The Miser,” written by French playwright Molière, performed from Feb. 7-10 and once in the daytime on Feb. 10. The five-act comedy was centered around love and money. 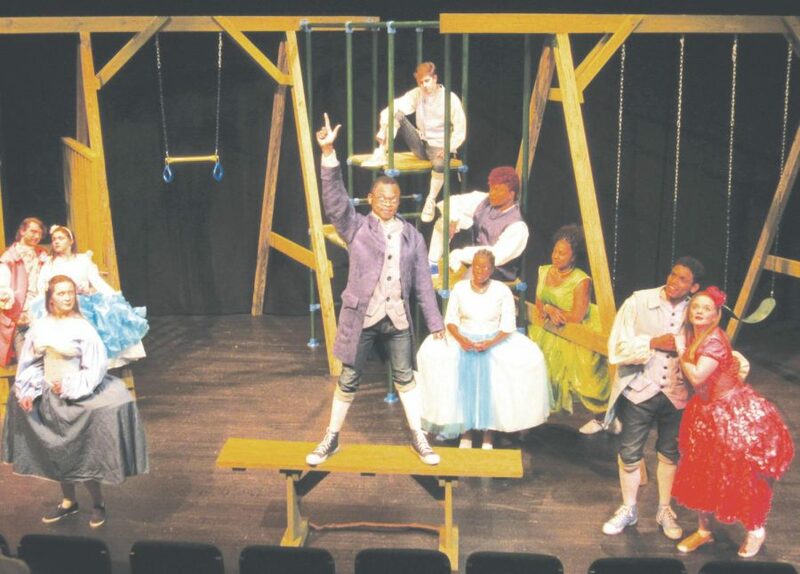 Professor of Theatre Arts Keith Best directed the production of “The Miser” which took place in the FMU Performing Arts Center Blackbox Theatre. “The Miser” follows the story of Harpagon, played by Malcolm Parker, who is only concerned with money and marrying his children off. Harpogon’s children, Élise and Cléante, were played by Melissa Gragg and Kevin Holloway. As the play went on, the audience saw Harpagon become more greedy. The audience finds out Harpagon is hoarding money, and his fear of someone finding the money he had hidden in his backyard became more intense. Harpagon’s paranoia increased, and he became worried about marrying his children off. Harpagon wanted to marry his own son’s lover. He also wanted to his daughter to marry an older rich man named Anselme. Harpagon’s children try to find a way to foil Harpagon’s plans to ruin their happiness. Eventually, Harpagon’s hidden money is found and he demands the person who found it be hung. Cléante held the money over Harpagon’s head and says the money will be returned if he and his sister can marry who they want. Harpagon agrees when he finds out that the man he wanted Élise to marry, Anselme, was actually the father of Valère and Mariane, played by Christopher Steele and Joy Price. Valère and Mariane were the love interests of his children. Harpagon agreed to let his children marry who they want because Anselme said he would pay Harpagon a substantial amount of money to let everyone marry as they wished. At the end of the play, the couples go off and get married and Harpagon lives with his money. Parker said his goal was to stay true to his character. Parker said because his character was the oldest in the play, it held even more challenges than playing a young character. Jared Cole, assistant professor of theatre arts, designed a playground for the set, consisting of a swing set and jungle gym. According to Parker, the set was representative of many different issues going on in the world. The childlike feel of the set is not the only thing about “The Miser” that stands out. Throughout the play, there were several sexual jokes made to intensify the plot. According to Parker, the scenes are always fun because he and the cast have a good dynamic. One of Harpagon’s signature moves was thrusting his hips. Parker said he had to put his body to good use. Hailey Reed, sophomore psychology major, said her favorite part of the play was when Harpagon addressed an audience member as part of an adlib. “I saw Harpagon address our honors advisor, Dr. Tuttle, and it was hilarious,” Reed said.